You can have FAP even if there are no other cases in your family. In about 1 in 4 cases, the gene mutation comes about by accident and not because you’ve inherited it. FAP is responsible for about 1 out of every 100 bowel cancers (1%). 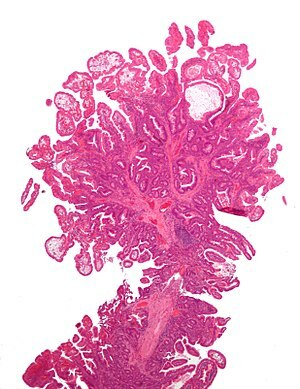 FAP causes lots of small non cancerous growths (benign polyps) to develop in the large bowel (colon). But some of these can develop into cancer over a long period of time. Because people with FAP have so many polyps, they have a high risk of getting bowel cancer. By their 40’s or 50’s, it is almost certain they will have bowel cancer. Specialists recommend that people with FAP have surgery to have all of their colon removed by the age of 25 to prevent them getting bowel cancer. 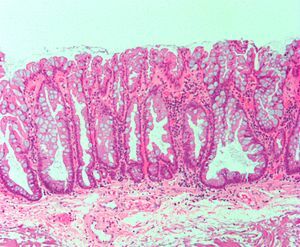 FAP is characterised by the presence of hundreds or thousands of adenomatous polyps in the colons of affected individuals, which often start in adolescence. 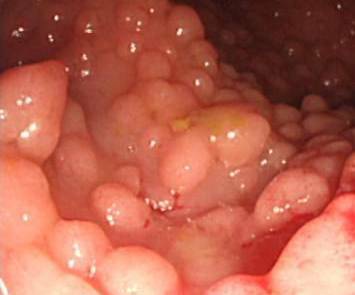 Cancerous polyps are very common in this condition, usually by age 40, without active management of the polyps and screening on a regular basis. Diagnosis is usually made following colonoscopy to confirm the presence of polyposis. Testing for mutation of the APC gene currently detects 95% of mutations present. In families where there is a clear history of FAP, screening usually commences by the age of 13 with annual sigmoidoscopy for the first few years, and then annual colonoscopy using a special dye spray. Where FAP is suspected, your GP will refer you to the local Regional Genetics Centre (such as the family history of bowel cancer clinic at West Middlesex University Hospital) for support and on-going management of the condition, because it has been known to affect adolescents and teenagers. Screening for the other complications of FAP is also possible, and the local Regional Genetics Centre will be able to advise about these on an individual basis, once they have seen you and your family in their clinic. The treatment for FAP is usually a planned operation to remove the affected part of the colon once polyposis has become established. This normally occurs in the late teens or early twenties. Later in life you may require other screening such as a gastroscopy which will be discussed with you in detail. These are very rare conditions and you will need the specialist help and support of an experienced colorectal team to help make the right decisions for the individual affected. This is another inherited syndrome which may cause multiple polyps and cancer of the large bowel, similar in many respects to FAP. However there is often not a family history because the risk must be inherited from both parents who are usually unaffected themselves. It is caused by a mutation on the MUTYH gene on chromosome number 1. 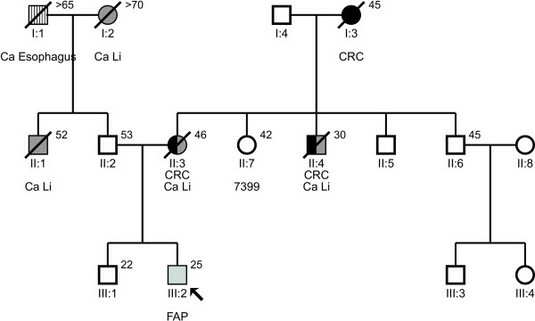 This is called autosomal recessive inheritance, and as demonstrated in the family tree below in which 2 brothers were diagnosed with polyposis and colorectal cancer in their 30s, means that only a single generation is likely to be affected. We can offer genetic testing for this condition however. People affected with this condition have a lower risk of developing cancer in their lifetime compared to FAP. This is a rare condition where a type of polyp called ‘hamartomatous’ can arise anywhere in the small or large bowel, and these polyps can develop in to cancer. There is often a characteristic feature present from childhood called buccal pigmentation which means that there is freckling on the lips and mouth. This kind of freckling can develop in adults but this is not usually due to Peutz-Jeghers Syndrome but perhaps another benign condition called Laugier-Hunziker syndrome, which is no concern. There are other hamartomatous polyposis syndromes such as PTEN hamartoma tumor syndrome which includes Bannayan-Riley-Ruvalcaba Syndrome. In HPS (also known as serrated polyposis syndrome) there may be just a few large hyperplastic polyps, mixed adenomas or sessile serrated adenomas, sometimes called serrated adenomas, usually on the right hand side of the large bowel. They have a significant cancer risk and should be removed. They are sometimes associated with a history of cancer in the family. It may be associated with cigarette smoking.